256GB - Class 10. A good rule of thumb would be to leave about 500MB of space left on the back end of these multi-GB cards. Never fill a card up to it's real capacity. About 200-250MB of unused space (before reaching maximum actual capacity) is maximum tolerant zone respectively, needed to ensure function. ® microSD UHS-I Cards. With storage capacities up to 256GB you can take more photos and videos without worrying about running out of space. Add storage up to 256GB to eliminate the dilemma of choosing what to keep and what to delete. Rated A1 for faster app performance and UHS Speed Class U1 and Speed Class 10 for Full HD video recording and playback. Take your phone or tablet to the snow, the pool, or the desert. Your card will survive, even if your device doesn't. The 400GB SanDisk Ultra microSDXC UHS-I card gives you the freedom to shoot, save and share more than ever before. Our highest-capacity microSD card is perfect for recording and watching Full HD video with room for even more hours of video. SanDisk Ultra Microsoft and Microsoft cards are fast for better pictures, app performance, and Full HD video. Built to Perform in harsh conditions, SanDisk Ultra microSD cards are waterproof, temperature proof, shockproof, and X-ray proof. 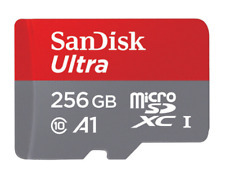 New SanDisk Ultra 256GB microSDXC UHS-I card with Adapter - SDSQUAR-256G-GN6MA by SanDisk. 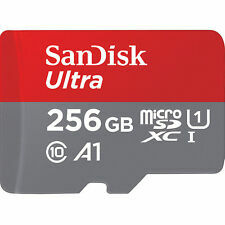 Capacity:256GB SanDisk Ultra 256GB microSDXC UHS-I card with Adapter - SDSQUAR-256G-GN6MA. Ideal for android-based smartphones and tablets. Ultra 256GB microSDXC UHS-I card with Adapter - SDSQUAR-256G-GN6MA. Class 10 for full HD video recording and Playback. Holds up to 24 hours of full HD Video. Ideal for android-based smartphones and tablets. 10-year limited manufacturer warranty Capacity:256GB SanDisk Ultra microSDXC and microSDHC cards are fast for better pictures, app performance, and Full HD video. Built to perform in harsh conditions, SanDisk Ultra microSD cards are waterproof, temperature proof, shockproof, and X-ray proof. UHS Speed Class U1 and Speed Class 10 for Full HD video recording and playback (Full HD (1920x1080) video support may vary based upon host device, file attributes, and other factors.). Rated A1 for faster app performance (Results may vary based on host device, app type and other factors.). 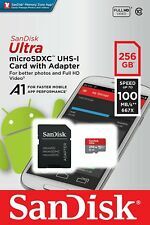 SanDisk Micro SD ideal for Android SmartPhones. Take your Phone or Tablet to the snow, the pool, or the desert. Your card will survive, even if your device doesn't. SanDisk Ultra microSDXC and microSDHC cards are fast for better pictures, app performance, and Full HD video. Built to perform in harsh conditions, SanDisk Ultra microSD cards are waterproof, temperature proof, shockproof, and X-ray proof. Ideal for android-based smartphones and tablets. Compatibility- Compatible with microSDHC and microSDXC supporting host devices. Class 10 for full HD video recording and Playback. Premium transfer speeds of up to 100MB/s. Uhs speed Class U1 and Speed Class 10 for Full HD video recording and Playback (full HD (1920x1080) video support may vary based upon host device, file attributes, and other factors.). SanDisk Ultra Microsoft and Microsoft cards are fast for better pictures, app performance, and Full HD video. Ideal for android-based smartphones and tablets. Compatibility- Compatible with microSDHC and microSDXC supporting host devices. A1-rated for better app performance1. Capture life at its fullest with the breakthrough capacity of this 256GB microSD card. It’s enough capacity to hold over 24 hours of full HD Video7. And you can transfer up to 1200 photos a minute6 when you’re ready to archive. Capacity: 256GB. Uhs speed Class U1 and Speed Class 10 for Full HD video recording and Playback (full HD (1920x1080) video support may vary based upon host device, file attributes, and other factors.). Capacity:256GB Capture life at its fullest with the breakthrough capacity of this 256GB microSD card. It’s enough capacity to hold over 24 hours of full HD Video7. And you can transfer up to 1200 photos a minute6 when you’re ready to archive. Capture life at its fullest with the breakthrough capacity of this 256GB microSD card. Built to perform in harsh conditions, SanDisk Ultra micro SDXC cards are water proof, temperature proof, shock proof, and x-ray Proof3.